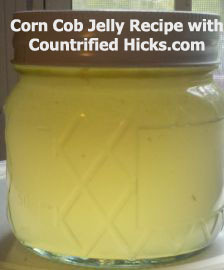 This week's feature is Countrified Hicks' Corn Cob Jelly. I have totally been wanting to try this for a couple of years - maybe this is a sign that I need to make it this year! To see how to re-create this, step-by-step, in your kitchen, head over and see this wonderful site. I just found your blog hop and I posted something about the movie Fed Up but I found a recipe that people seem to love and I added that. I am headed over to check out the corn recipe now. Thank you for hosting! Have a fantastic week!